Greek yoghurt is my 'breakfast gravy'. It meshes granola, fruit, cereal and smoothies. It's more versatile and more satisfying than regular yoghurt, as it's higher in protein. So it was fairly easy to come up with something to submit to this month's Breakfast Club, hosted by Sarah over at Maison Cupcake. These pancakes are nice enough with maple syrup, but teaming them up with sour & salty strained yoghurt and sweet but tart lemon curd, makes for a fresher, more satisfying breakfast, with more texture and variety in each bite. Lemon curd is a cinch to make: it takes less than ten minutes and it's also cheaper than a good store-bought version. Just ensure that you add the eggs to the mixture last, so that they do not hit hot butter and start to cook! Don't bother buying buttermilk from the supermarket. All you need to make your own is milk and lemon juice; see the recipe below. The only problem with these pancakes is trying to stop yourself from going back for third helpings. The batter will keep for a few days, covered in the fridge. As long as it's stored in a sterile jar, the lemon curd will keep refrigerated for about two weeks. Put the flour, baking powder, salt into a large bowl with most of the lemon zest (keep a couple of pinches of zest to one side for serving) and whisk together to combine. Gradually whisk the egg and milk mixture into the dry ingredients, until a smooth batter is formed (it should coat the back of a ladle). Stir in about three quarters of the blueberries, reserving the rest for serving. Heat a frying pan over a medium heat. Use the knob of butter to coat the pan. Once the pan is coated, stir the excess butter into the pancake batter. When the frying pan is moderately hot (the pan should not smoke), pour in the pancake batter; about half a ladle at a time, but use less or more, depending on your preference for portion sizes. Cook for two to three minutes (fear not if some of the berries burst whilst cooking: this is a good thing). When bubbles start to break on the surface of the batter, flip and cook the other side of the pancake. Transfer cooked pancakes to a warmed serving plate and keep in a warm place while you cook the other pancakes. 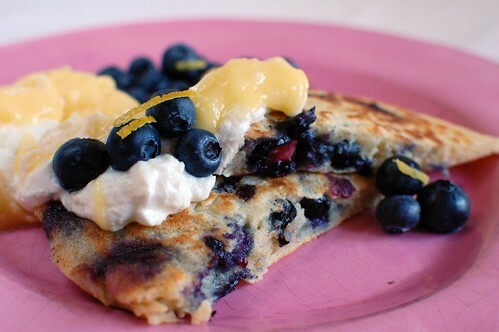 Serve with a dollop of yoghurt and lemon curd. 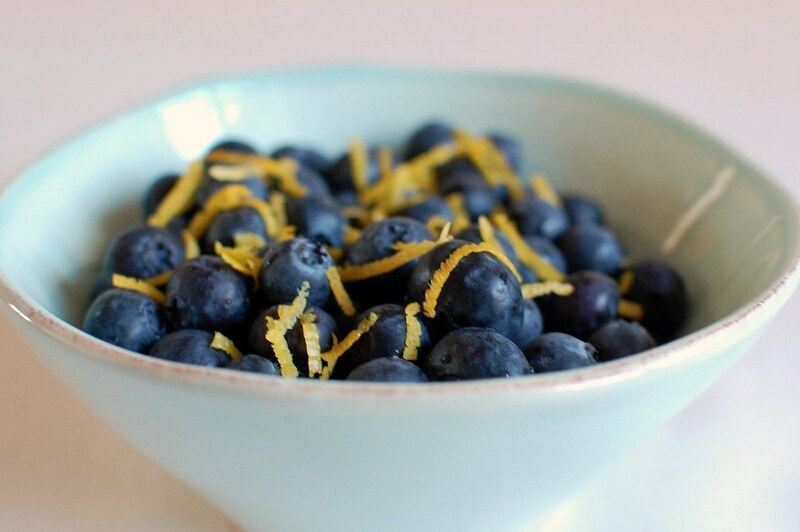 Finish the plates with the reserved blueberries and lemon zest. I like my curd quite tart. If you prefer yours slightly sweeter, reduce the lemon juice by 25ml and only use a teaspoon of zest. Use a double boiler to melt the butter. Once melted, whisk in the lemon juice and zest, caster sugar and eggs (in that order). Keep whisking until the mixture thickens into a custard. Leave to cool then spoon into a sterilised jar. Gently whisk the lemon juice and milk together. Leave to stand for five minutes, to allow the lemon juice to curdle the milk. Thanks for taking part in Breakfast Club. It looks lovely! Have you seen my microwave lemon curd recipe? This is super-duper and your photos are looking wonderful. I always forget (duh!) that I can make my own buttermilk, I must bear this in mind if I am taken with the desire to cook something using it days away from my trip to the proper supermarket. Thanks very much for taking part in Breakfast Club! Thank you, both, this is a great challenge for me. Happy to say that this is now my first ever post to be accepted by Food Gawker; happy days! I recently had my first acceptance from FoodGawker, too. The spike in traffic made me very dedicated to try to get more photos accepted. Wow, it was amazing. Was it the same for you? Thanks for stopping by my Baileys macaron cocktails Sally! your blog is scrumptious!